Growing meat in the laboratory may do more damage to the climate in the long run than meat from cattle, say scientists. Researchers are looking for alternatives to traditional meat because farming animals is helping to drive up global temperatures. However, meat grown in the lab may make matters worse in some circumstances. Researchers say it depends on how the energy to make the lab meat is produced. Why are scientists trying to grow meat in the lab? There's increasing concern about the impact of meat consumption on the planet. Around a quarter of the greenhouse gas emissions that are driving up temperatures are estimated to have come from agriculture. Beef production is considered the worst offender with cattle emitting methane and nitrous oxide from their manures, but also from their digestive processes. There are also additional gases from fertiliser application to land, from the conversion of land for pasture or feed production. 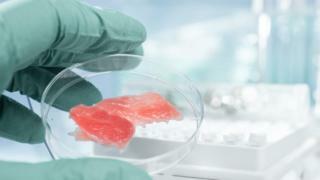 Because of these impacts on the climate and because of a range of other concerns about issues such as welfare and sustainability, scientists have in recent years sought to develop meat that can be grown from animal cells in factories or laboratories. One perceived advantage would be much lower greenhouse gas emissions, especially methane. How have these meat growing efforts fared? Back in 2013 a Dutch team of scientists produced what they claimed was the world's first burger grown in a lab. Since then, there's been a lot of hype and noise but some real progress as well. Essentially, the process involves collecting stem cells from animal tissue and then getting them to differentiate into fibres, these are then developed and grown into a sufficient mass of muscle tissue that can be harvested and sold as meat. Firms in California have taken some important steps. 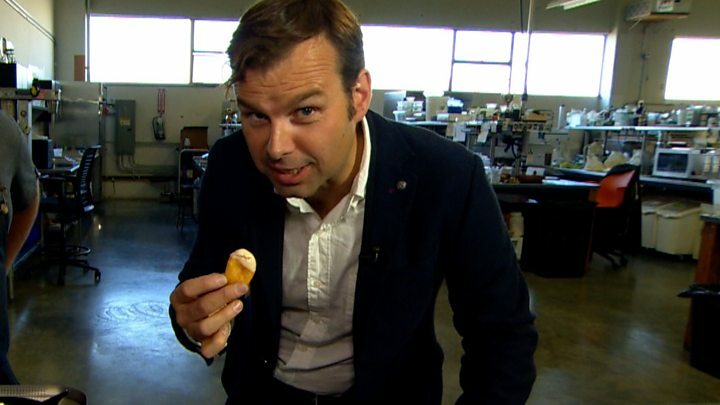 Last year, chicken nuggets, developed by a firm called Just, were tasted by my colleague James Cook. Tyson Foods, one of the biggest US meat processors, has also invested an undisclosed amount in Memphis Meats, another firm in this field that says it is "harvesting cells instead of animals". But despite the promises, no-one has yet mass-produced cultured meat for sale to the general public. So what has this new study found? Researchers from the Oxford Martin School looked at the long-term climate implications of cultured meat versus meat from cattle. The scientists say that previous studies had tended to look at the various emissions from cattle and converted them all to their carbon dioxide equivalent. The team says this doesn't give you the full picture as methane and nitrous oxide have different impacts on the climate. "Per tonne emitted, methane has a much larger warming impact than carbon dioxide. However, it only remains in the atmosphere for about 12 years, whereas carbon dioxide persists and accumulates for millennia," said co-author Prof Raymond Pierrehumbert. "This means methane's impact on long-term warming is not cumulative and is impacted greatly if emissions increase or decrease over time." The scientists' climate model found that in some circumstance and over the very long term, the manufacture of lab meat can result in more warming. This is because the emissions from the lab are related to the production of energy which is almost entirely made up of carbon dioxide, which persists in the atmosphere for hundreds of years. "The climate impacts of cultured meat production will depend on what level of sustainable energy generation can be achieved, as well as the efficiency of future culture processes," said lead author Dr John Lynch. "If the lab-grown meat is quite energy intensive to produce then they could end up being worse for the climate than cows are." What happens if meat consumption goes down in the future? One of the scenarios that the researchers looked at saw meat consumption increase initially and then decline to more sustainable levels over time. The scientists found that the cattle production systems generally showed greater peak warming within this time frame, but as a result of the persistence of large scale CO2 emissions in the early period of production for cultured meat, "any long-term benefits of this production are further reduced compared to cattle systems. "It may well be that these things are so energy efficient that it would simply be replacing a high-impact activity with a low one," said Dr Lynch. "But from the cultured meat systems that are out there at the moment, we can't make that assessment for sure yet." Surely making meat in the lab might have other benefits apart from climate change? Yes, the authors say that a number of other factors should be considered including water pollution that cultured meat may avoid. But other experts say that isn't so clear cut. "Artificial meat may result in the presence of organic or chemical molecule residues in water, because the process would need to produce huge amounts of chemical and organic molecules, such as hormones, growth factors, to add to the culture medium to grow the meat" said Prof Jean-Francois Hocquette, at the French National Institute for Agricultural Research, who wasn't involved with the study. Will this research discourage people from eating cultured meat? It's far too early to tell as the products really haven't emerged from the laboratory yet. Some researchers say that cultured meat has many other barriers to overcome before it's a huge hit with consumers. "It is worth noting that most consumers have never heard of cultured meat, and many don't know that conventional meat production damages the environment," said Dr Chris Bryant from the University of Bath who has studied the issue. "Consumers who learn about cultured meat usually think primarily of the benefits to animals. Having said that, environmental factors will be an issue for some consumers, and many environmentally conscious buyers are already moving away from meat and dairy consumption." The new study has been published in the journal, Frontiers in Sustainable Food Systems.